March 27th was Neil’s 50th birthday and to mark the occasion he arranged a golf day for his friends, followed by a party on the terrace outside the clubhouse. It makes sense to just keep going after the golf and not go home to eat, sleep and eat. The theme was Hawaii Five-O (it seemed appropriate!) so lots of loud shirts. The competition seemed secondary to the birthday celebrations, but Alicia Saunders won the day with 39 points. Barry Answer thought he had divine intervention on his last outing (it was Good Friday) when on the 11th his ball skimmed 3 times on the water, bounced over the bunker and onto the edge of the green. He did it again on Sunday (Palm Sunday) skipping over the water and onto the bank which meant it was playable. I had my camera at the ready in case he fell over backwards into the lake, but the angels deserted him this time – finishing in a watery grave at the 2nd attempt! Barry thought that someone up there was looking over him……………..
well if they were, I think they would be laughing!………. Rachel and Paul put on a great spread for Neil’s many friends who turned up, and Byron kept up the pace with a very entertaining act. a golf theme for his cake……………. nice to sit outside in March……………..
Alicia & Kev see the funny side…………..
Don Henry shows that he has some moves……..
the girls had a great time on the dance floor………. but there’s only one girl for Neil………………..
And now I have found a few fireman jokes………………………. The fireman says “Hey little boy. What are you doing?” The little boy says “I’m pretending to be a fireman and this is my fire truck!” The fireman walks over to take a closer look. “Little boy that really is a nice fire truck!” the fireman says. “BELL 1 rings and we all put on our jackets. “BELL 2 rings and we all slide down the pole. “BELL 3 rings and we’re on the fire truck ready to go. The next night he came home from work and yelled, “BELL 1!” Lynn promptly took all her clothes off. When he yelled “BELL 2!” Lynn jumped into bed. When he yelled “BELL 3!” they began making love. “What the hell is BELL 4?” asked Neil. Sorry the post was late this week, no internet Saturday/Sunday. This week was the 2nd major of the year with 68 players, who amazingly, all turned up! It was pairs drawn out, so if you were drawn out at the end (as I was!) it was just unlucky, with a lovely calm day becoming a windswept test of golf. I never fail to be surprised by what we find on the golf course – on the 9th we thought we could see a couple of walkers at the side of the fairway bunker. When we got nearer it was a couple of Spanish teenagers playing football without a care in the world. Obviously they had no idea that the golf course was for golf and that it was dangerous – it just looked like a park with lakes! Thanks to Jean for acting as starter, so that Graham could play in his own event. The prizes definitely had a easter theme……………lots of chocolate rabbits………..also thanks go to Christine Lawson who donated a box of Quality Street, and Alicia & Kim who sent a box of mini-eggs around the bar. The later start for the presentation (7.30pm) seemed to go well, with lots of people in the bar watching the winners get their prizes. It was followed by a disco with Byron as the DJ. We did have an invader onto the stage during the presentation, but Alicia soon sent him packing…………..dealt with much more promptly than a streaker at St James’ Park! this year’s winners are Nick & Ricky……………..
and in 2nd place were the Scandinavians… Lis (Denmark) & Asbjorn (Norway)……..
and here he is with partner Jeff………. Alicia & Rune had a great score of 61, also Alicia won the par 3 prize………………. And out on the course these were mine and Kevin’s partners for the day, Norwegians Borre Hagen and Lasse Johannesen. a few weeks ago Borre would have been submerged…….now he was able to move his ball 150 yards up the fairway………. A reminder that next year’s membership fees of 5€ are due on Friday………Kevin will be on the desk Friday morning to collect any that were not able to be paid Wednesday night. Please try to pay before Friday as the rules state the entries will not be accepted for the Friday competition if membership is not paid before 8pm Wednesday night (this information has been on the start sheet in the clubhouse every week for 9 months). 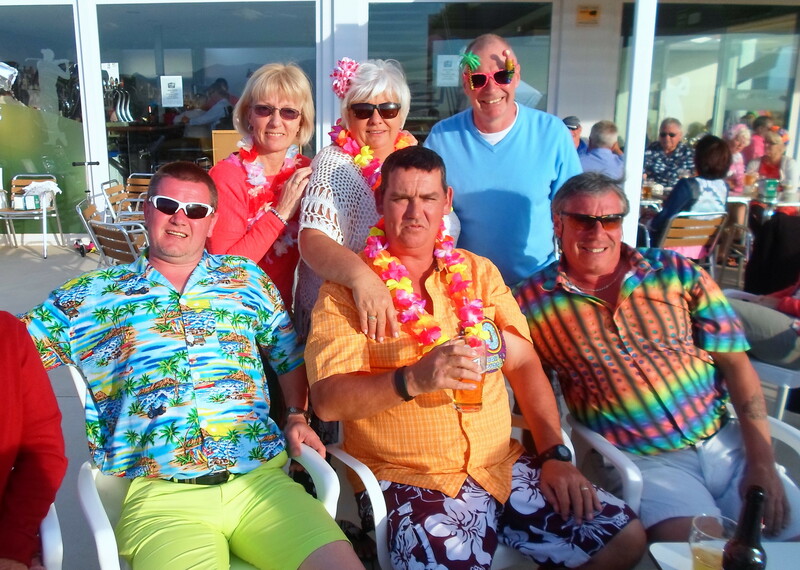 Next week is the April Apollo Air individual stableford, but before that is Neil’s 50th birthday bash…….on Sunday he is holding a golf competition (all times now full) followed by a party on the terrace of the clubhouse. Should be a fun day, with everyone encouraged to dress in Hawaii Five-O fashion (he is 50!). Maybe another blog tomorrow to show you what happened! the honours boards are now in place…………. the boards are next to the trophies, major winners have their photo alongside for 12 months……..
Look back for the reports of the celebrity-am and yesterday’s St Patrick’s Day competitions, both played this week. This competition was a twist on the normal format with 2 scores counting on the par 3’s, 3 to count on par 4’s and all 4 to count on the par 5’s. Good conditions for the 38 players with not much wind, and occasional glimpses of the sun. There were a few sore heads out there this morning after a great St Patrick’s night in the Clover, our team were like the red arrows off the first tee, I went dizzy when I had to bend down to mark my ball and Ken Saunders never touched a fairway until the 6th! Added to my 3 fresh air shots we were never going to win! A few things got lost – John Donaldson said he set off with two whirlygigs on the first but they were never to be seen again (that’s what they are called in Scotland, but the Scandinavians know they are Danish pastries!). Karin Dahl lost her sunvisor (how many holes did you play before you knew you had lost it? – last week I noticed I had lost my cap on the 18th, turned out I had taken it off when I called in home on the 12th!). Ken lost something – his temper! After a few futile swings at the ball in the rough on hole 2, I saw his club sailing through the air, and even that went in the wrong direction! I left my wedge in front of the 17th, thanks Karin for telling me in the bar. Bad day!! only half the team present, but Asbjorn doesn’t usually get his photo on the blog……. Kevin has installed the honours boards for our major competitions this week. Thanks to Anthony Howell who suggested it and donated the first board. Following the AGM we decided to have maybe 4 awaydays in 2016. The first is to an old favourite Aguilon. It will be on Monday 25th April and there are spaces for 40 players. The first tee time is 11.16, so we will leave the Al Kasar at 09.30 on the free bus. The cost per person will be 32€ including buggy (must be shared). This will be a very popular event so to reserve your place you need to inform a committee member along with a 10€ deposit (should deter back-outs!). 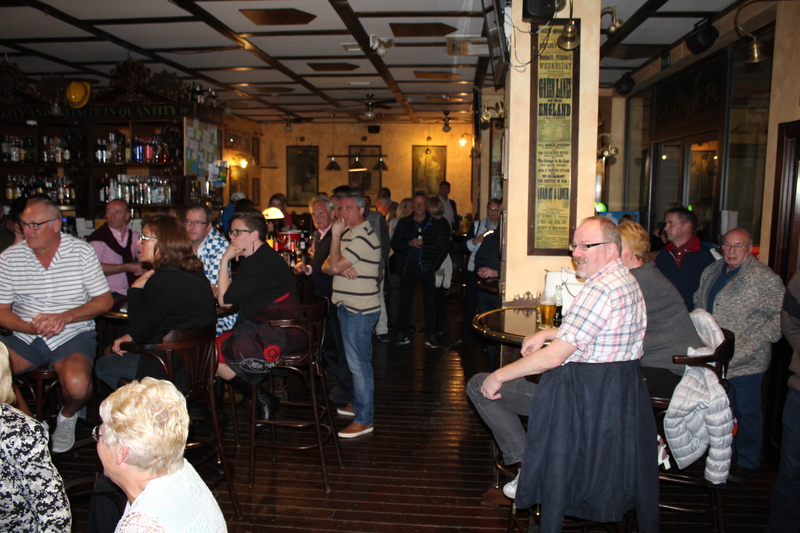 The annual memberships (5€ for renewals, 20€ for new members) are due from April 1st so please renew with Kevin in the Clover Wednesday or Friday nights (we had about 650 members in the current year). Kevin is selling the society shirts (15€) – ask him when you are there. The dates for the 4 Dublin Crystal events for 2016 has now been confirmed. All Fridays, April 15th, May 27th, August 26th and October 21st. The fixture list on this blog has now been altered to accommodate these changes. Next week is the 2nd major of the year, the Graham White Pairs Stableford. Partners and times will be drawn at 8pm on Wednesday in the Clover. The start sheet will be in the golf shop until lunchtime Wednesday. We are reintroducing the bookings facility for members who are not on site to put their own name down. These names will not be added until the Wednesday night prior to the Friday competition, to give those actually on site first choice of times. So to use this off-site facility please contact daverollett@cdagolf.com and copy me in also at barry@cdagolf.com (when Dave is away I will take over). Also Alicia has a volunteer sheet for anyone who is willing to act as starter on Fridays – a thankless task, which means that the starter has to go out last (if they are playing). Contact her at alicia@cdagolf.com if you can help. Welcome to the St Patrick’s day blog – an Irish theme running through this week’s edition.The middle competition of a triple header this week attracted a very good entry of 44 players. 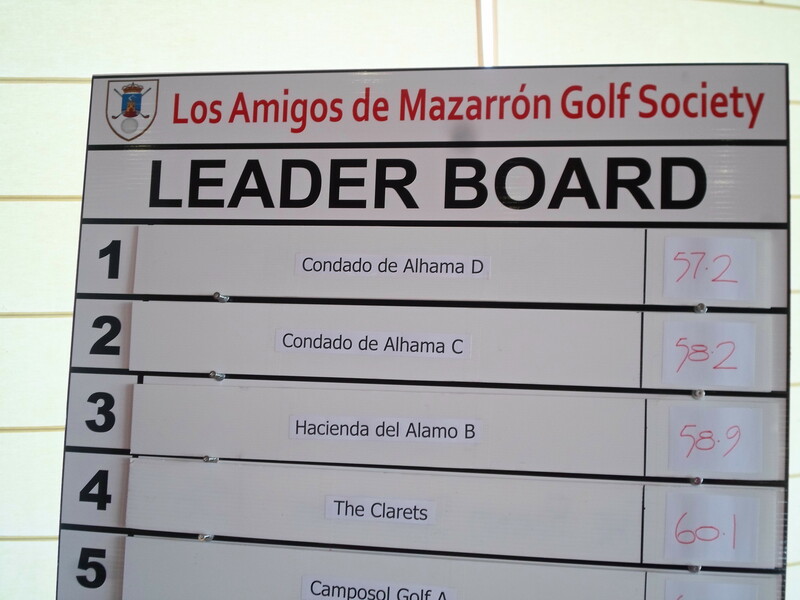 The first leg (Los Amigos de Mazarron celebrity-am) is reported in the previous blog (see link at top of page). Back to the usual breeze but a beautiful Murcian summer’s day. It didn’t affect Kjell Mundheim though, as he was well clear of the rest with a score of 44 points. In fact he had already destroyed the opposition with 29 points on the front 9! There were 3 ladies on the same score! Kjell has been in fine form lately…….but 4.4 cut may make it harder…………. well, we needed an Irish winner and it was Paddy Kerr……. Don usually wins the booby prize, and did it again, but he beat all the good players to nearest the pin on 17………..
Gordon was nearest in 2 on the 8th…………. Barbara may not be very big, but was big enough to come out on top over the par 5 holes……………. Did think that the Irish might have been greener………but they are very superstitious, so have had some bad experiences wearing green in the past………………. this was the Irish team……Owen Moore, Jim Alwell, Jim Creamer, and someone who sounds Irish – Paul Harrington. Fred Twomey made an effort…….looks very smart in his green and white, along with the Irish flag…………..
and Fred’s wife Bernie shows that you don’t have to be over the top to look very smart…………..
Alicia is checking the cards, and handicap secretary Chris is poised alongside with the axe……………. After the presentation in the Clover bar we were entertained by the ever popular Dee (my favourite!) who had everyone on their feet dancing the night away. She is not only a great singer but interacts with the audience, and involves them in her show. 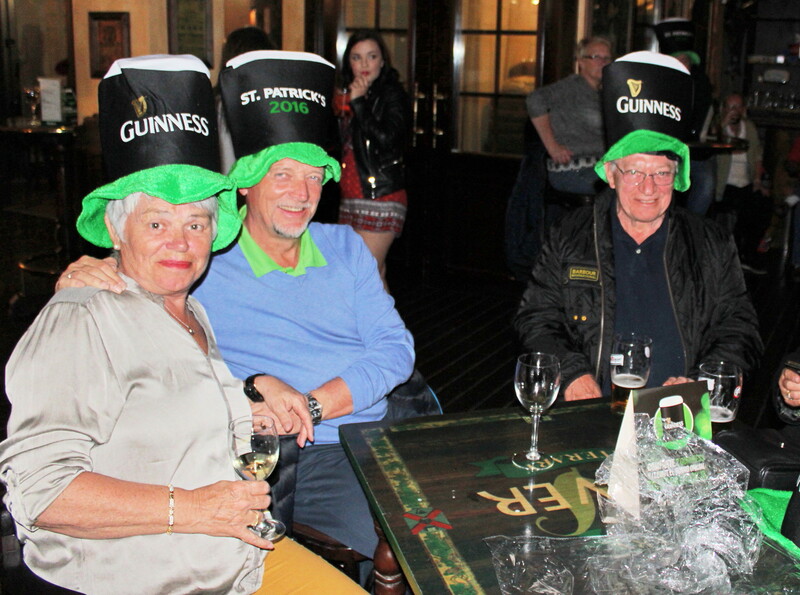 We all joined in with the spirit of the day, Irish or not……the Clover gave out free hats to promote St Patrick’s. 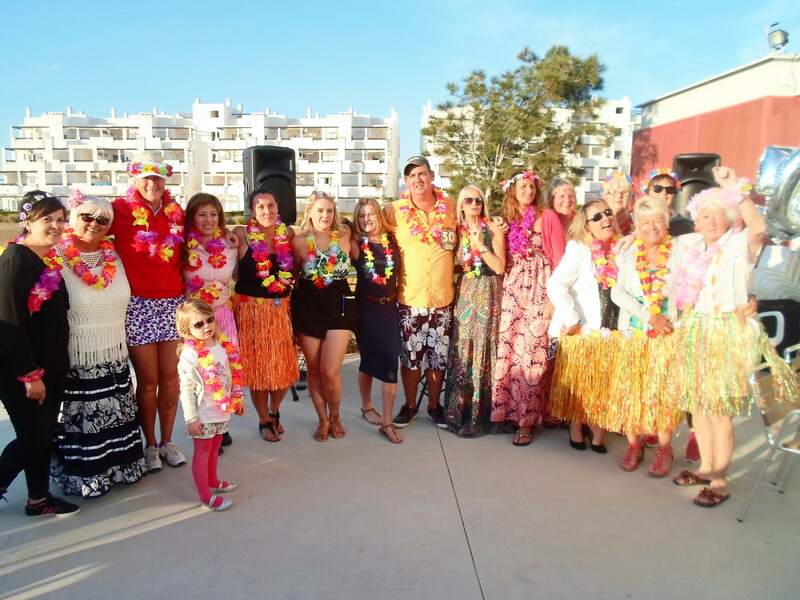 And here are more to show how we all joined in with the party atmosphere…………………. Next up is the 4 person team on Friday, the report will be at the weekend as usual. And now for our annual Irish jokes, where we are allowed to take the mickey! Q. What’s a Catholic priest and a pint of Guiness got in common? 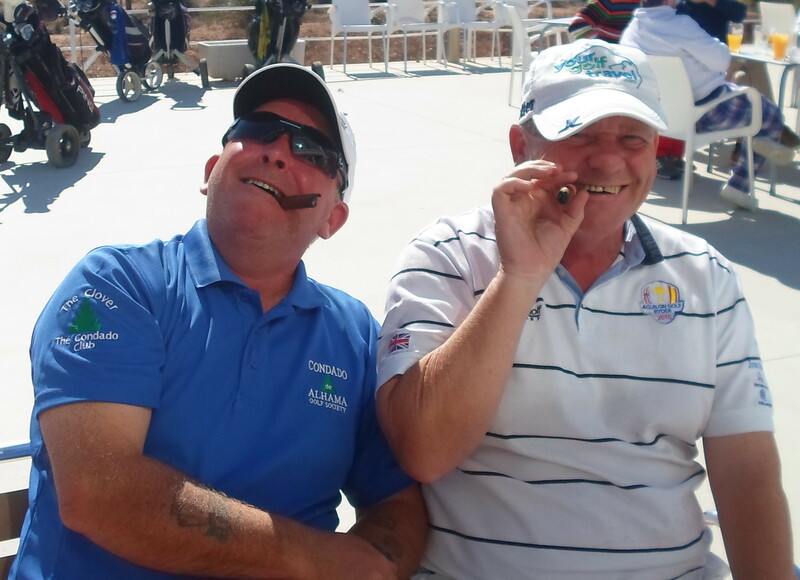 Mick and Paddy are reading head stones at a nearby cemetery..
Los Amigos de Mazarron held their annual charity event at Camposol golf club on Tuesday with 18 teams of 4 playing a texas scramble with a shotgun start. Celebrities included ex- footballers Tony Currie (Sheffield United & Leeds), Steve Kindon (Burnley & Huddersfield Town), Peter Reeves (Charlton Athletic) amongst others. 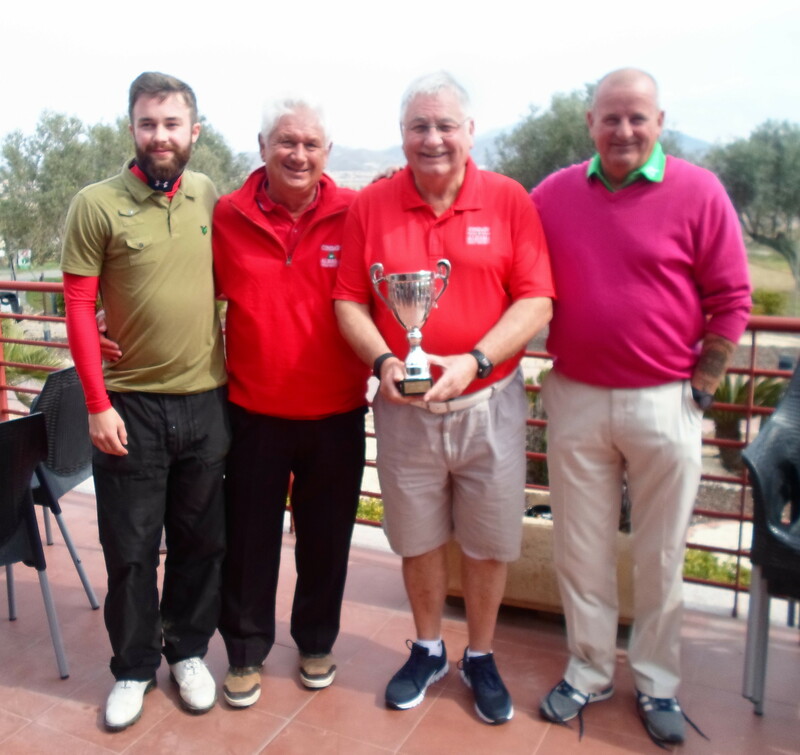 Last year our team of myself, Dave Lloyd, Kevin Smith & Chris King were just pipped for the title by 0.14 of a shot – this year our ‘D’ team (Barry Barker, Barry Answer, Steve Bell & Daniel Don) made no mistake, winning with a fantastic score of 57.2, with the ‘C’ team of Neil Simpson, Fred Harrington, John Collins & Chris McAllister just 1.0 behind in 2nd place. Our round was just about perfect with 9 birdies and no bogies on the card. We had one lucky escape on the 9th (our 17th) where we needed to get Barry A’s last drive in, but with him 160 yards back and Daniel 15 yards from the green we went for the birdie. Daniel thinned his chip through the back and so did I. Then Barry A chunked it into the bunker, and so did Steve. Then faced with a 15 yard chip back the first 3 made a mess of it (again). But cometh the hour cometh the man – Steve rolled a lovely chip into the hole for an unexpected birdie! by the par 5 in 2, but a tricky chip for all of us……………. Our last hole (10th) – 3 nearly putts, then mine just dropped in over the front edge for our 9th birdie………. the winners – Daniel Don, Barry Barker, Barry Answer, Steve Bell…………………. 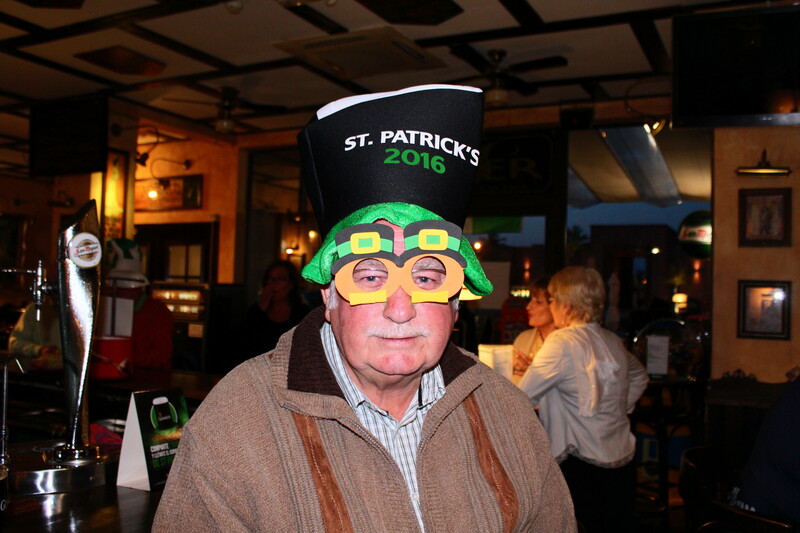 The next blog is only a couple of days away……….St Patricks Day on Thursday has a big entry. remember the motion at the AGM regarding what colour shirt we should adopt for awaydays? Peter Reeves is sitting on the fence……..I think he covered all possibilities today…………. This week was the March edition of the Apollo Air monthly stableford with 45 players taking part. We were 2nd out and the wind was horrendous. Putting on fast greens, with wind behind was so difficult – downhill putts were like putting over glass! However, the wind dropped for the later players, so the possibility of making it a non-qualifier receded. It was so cold at the start of play that I needed a shirt, windbreaker top and fleece – when we eventually got back to the bar it was short sleeves and shorts! So the later starters did have an advantage (for a change!). Usually when conditions are tricky it is the division one players who cope the best, but this week they struggled, and division two and the ladies showed them how it was done! Eli Holdhus took the top prize following husband Jan’s success last month. Eli was this month’s champion…………. division one winner Paul with ladies winner Alicia……….. Thanks were given to Jim Hershaw, who this week brought over another bagful of splendid gifts which are so good that they may be used in an auction at our annual charity day (the Seve Trophy). the yorkies…….me, Chris and Kev celebrate my birdie on the long 16th…………. the Marx brothers find 2 big Havana cigars left in the ash tray……………. a great 2nd shot to 8 with the wind against…..
You might not have noticed, but I have started to put the start sheet on the blog on Thursdays – no need to come to the Clover to check your time. Also you can see which of your friends are playing………….Also the results in individual events will include the winners basic handicaps (not including slope). .Next Tuesday we have the celebrity-am golf competition at Camposol golf club where we have entered 4 teams in the texas scramble. Then the St Patrick’s individual stableford is on Thursday, followed by the 4 person team event on Friday – a really busy week, all of which will be reported on the blog so watch out for extra posts! Easter Greensome, 8.30 shotgun start, Saurines Golf. A greensome is where both players tee off and then select the best drive. Both players then alternate shots till the ball is holed out. A team may consist of a man and a woman – the lady will play from the ladies tees. Scoring will be stableford. Easter Eggs will be hidden around the course and those that bring an egg to the pro shop at the completion of play will win a prize. Shambles, 9.00 shotgun start, Saurines Golf. A Shambles is similar to a greensome but after selecting the best drive both players then play their own ball from that spot to complete the hole. Scoring will be the best ball of the team, stableford. Double Shambles, 9.00 shotgun start, Saurines Golf. Same format as a Shamble but scoring is the combined total of both players scores, stableford. €10 of the entry fee must be paid in cash. If you need a partner please let me know and I will try and pair you up with another golfer. It’s strange isn’t it? You stand in the middle of a library and go ‘aaaggghhh’ and everyone just stares at you. Do the same thing on an airplane and everyone joins in. Our ice cream man was found dead on the floor of his van covered with hundreds and thousands………the police say he topped himself. Answerphone message………if you want to buy marijuana press the hash key……..
Daisy: ‘I was artificially inseminated this morning’. Dolly: ‘I don’t believe you’. Daisy: ‘It’s true, straight up, no bull’. This week was a 4 person team event with 44 players. The best 3 scores counted and the top two teams were well clear of the rest – only 4 of the 11 teams bettered 100pts, which is quite low for this format. The reason for this was the extremely strong winds, which added to firm fairways and greens made scoring difficult. 2nd place went to Phil, John, Ken & Alicia…….l………. Neil asked all members to make sure that they rake the bunkers. They were a disgrace on Friday, but as we were first out we know it wasn’t us, but visitors in front. Just to cover ourselves with the management company GNK. With Kim in the UK, Janice Collins (right) was a great deputy selling the raffle tickets with a great technique of pleading and pity, which persuaded people to part with their money…………also notice Don Henry in the background videoing the presentation live. Check out periscope (the app) to see the results, but it is only available for 24 hours. Barbara Rollett came to Janice’s aid by folding the counterfoils ready for the draw…………..
.Vice captain Neil Simpson is standing in for the captain Dave Lloyd, while he is back in the UK awaiting the birth of his first grandchild, and was assisted on the stage by president Dave Rollett. Also thanks to Peter Reeves who has been acting as starter while he recovers from his operation. A reminder of dates for October. Just to remind those who want to book flights for the October competitions, Barry Answer trophy is Friday October 7th, Viking Cup is Tuesday 25th October and the Seniors is Friday October 28th. Next week is the Apollo Air individual stableford, but remember that start times have now been moved back, beginning at 9am. Following the AGM election Ken Saunders and myself can be considered the Vice Squad. Also in the team are chief inspectors Alicia Saunders and Susan Perry, who will inspect everything that we do! Do you remember this Scott??? .Thanks to Dorothy Simpson who has been providing our weekly cartoons. My dream buggy………….doesn’t need clubs!